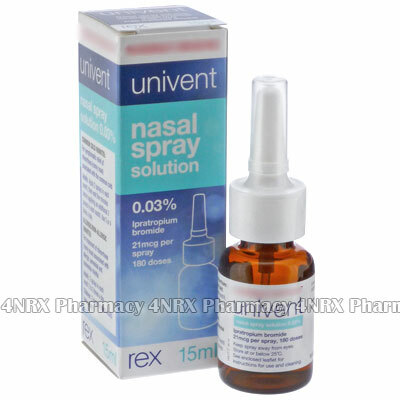 What is Univent Nasal Spray (Ipratropium) used for? Univent Nasal Spray (Ipratropium) is an inhalable bronchodilator used to treat patients suffering from allergy symptoms such as a runny nose or blocked nasal passages. It operates by reducing the amount of mucous produced in the nasal passages to allow easier and more comfortable respiration. Your doctor may also prescribe it for other unlisted conditions. How should I use Univent Nasal Spray (Ipratropium)? Univent Nasal Spray (Ipratropium) should be used according to your doctor`s directions to get the best results from treatment. The normal dosage is one or two daily administrations of one spray, but your particular instructions will be based on your health condition and the severity of your symptoms. To administer the medicine gently shake the bottle to mix its contents, remove the top, insert the applicator into the nostril, and inhale while squeezing the pump to spray one dose. If you have not used the medicine for several days it may be necessary to prime the pump by pointing the nozzle away from your face and operating the pump until one spray is dispensed. If more than one spray is prescribed you are recommended to alternate nostrils to prevent potential irritation. Ask your doctor any questions you have about the medicine to make sure you are using it correctly. What are the side effects of Univent Nasal Spray (Ipratropium)? Serious side effects that may require emergency medical attention are urinary retention, painful urination, blurry vision, deterioration of your symptoms, or trouble breathing after administration. These conditions may require reduced dosages or application frequency to prevent further health problems from occurring. Do not use Univent Nasal Spray (Ipratropium) if you are allergic to ipratropium or if the patient being treated is under twelve years old. Also inform your doctor if you have cystic fibrosis, narrow angle glaucoma, trouble urinating, or an enlarged prostate as these conditions may cause unexpected problems during treatment. Strictly use Univent Nasal Spray (Ipratropium) as prescribed and follow all instructions provided by your doctor. Safe, suitable, and optimum dosage can vary and is dependent on the patient`s health and medical history, as well as the condition you are treating. Univent Nasal Spray (Ipratropium) may not be safe or suitable for all patients. Always ensure your doctor is informed if you are pregnant or breastfeeding, using any other type of medication (including non-prescription medicine, vitamins, and supplements), as well as if you have any allergies, other illnesses, or pre-existing medication conditions.